Stephen Kinzer (born August 4, 1951) is an American author, journalist and academic. He was a New York Times correspondent, has published several books, and currently writes for several newspapers and news agencies. During the 1980s Kinzer covered revolution and social upheaval in Central America, as well as published his first book, Bitter Fruit, about military coups and destabilization in Guatemala during the 1950s. In 1990, The New York Times appointed Kinzer as the head its Berlin bureau, from which he covered Eastern and Central Europe as they emerged from Soviet rule. 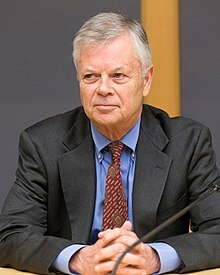 Kinzer was the New York Times chief in the newly established bureau in Istanbul (Turkey) from 1996 to 2000. Upon returning to the United States, Kinzer became the newspaper's culture correspondent, based in Chicago, as well as teaching at Northwestern University. Kinzer then took up residence in Boston and began teaching journalism and United States foreign policy at Boston University. He has written several non-fiction books about Turkey, Central America, Iran, the US overthrow of foreign governments from the late 19th century to the present, as well as Rwanda's recovery from genocide. Kinzer also contributes columns to the New York Review of Books, The Guardian, and the Boston Globe. He is a Senior Fellow in International and Public Affairs at the Watson Institute for International and Public Affairs at Brown University. like an errand boy, building up those stories that fit in with Reagan's agenda—one day it's the church, the next day it's the Miskitos, then the private sector. In the last two weeks I've seen eight articles by Kinzer that say exactly what the White House wants. Kinzer always raises questions about Sandinista intentions, whether they're truly democratic, and so on. When you analyse his articles you see he's just responding what the White House is saying. Look, one of the things that Edward Herman and I did in Manufacturing Consent was to just look at the sources that reporters go to. In a part that I wrote, I happened to be discussing Central America, so I went through fifty articles by Stephen Kinzer of The New York Times beginning in October 1987, and just asked: whose opinions did he try to get? Well, it turns out that in fifty articles he did not talk to one person in Nicaragua who was pro-Sandinista. Now, there's got to be somebody—you know, Ortega's mother, somebody's got to be pro-Sandinista. Nope, in fact, everybody he quotes is anti-Sandinista. [Daniel Ortega was the Sandinista President.] Well, there are polls, which the Times won't report, and they show that all of the opposition parties in Nicaragua combined had the support of only 9 percent of the population. But they have 100 percent of Stephen Kinzer—everyone he's found supports the opposition parties, 9 percent of the population. That's in fifty articles. The effects of U.S. intervention in Latin America have been overwhelming negative. They have had the effect of reinforcing brutal and unjust social systems and crushing people who are fighting for what we would actually call 'American values.' In many cases, if you take Chile, Guatemala, or Honduras for examples, we actually overthrew governments that had principles similar to ours and replaced those democratic, quasi-democratic, or nationalist leaders with people who detest everything the United States stands for. In his 2008 book A Thousand Hills: Rwanda's Rebirth and the Man who Dreamed It, Kinzer credits President Paul Kagame for what he describes as the peace, development, and stability in Rwanda in the years after the Rwandan genocide, and criticizes the leaders of Rwanda before the genocide, such as Juvenal Habyarimana. In an opinion piece, he wrote in 2016 that Aleppo had been liberated from the violent militants who had ruled it for three years, but were liberated by Assads forces. However, the American public was told "convoluted nonsense" about the war. He further noted: "At the recent debate in Milwaukee, Hillary Clinton claimed that United Nations peace efforts in Syria were based on "an agreement I negotiated in June of 2012 in Geneva." The precise opposite is true. In 2012 Secretary of State Clinton joined Turkey, Saudi Arabia, and Israel in a successful effort to kill Kofi Annan's UN peace plan because it would have accommodated Iran and kept Assad in power, at least temporarily. No one on the Milwaukee stage knew enough to challenge her." Secretary Clinton was referencing the Geneva I Conference on Syria, during which principles and guidelines for a power transition were agreed to by the major powers. According to the logic behind American strategy in the Middle East — and the rest of the world — one of our principal goals should be to prevent peace or prosperity from breaking out in countries whose governments are unfriendly to us. That outcome in Syria would have results we consider intolerable. ^ a b c "Stephen Kinzer". Carnegie Council for Ethics in International Affairs. ^ "Stephen Kinzer". nybooks.com. Retrieved December 13, 2016. ^ "Stephen Kinzer". theguardian.com. Retrieved December 13, 2016. ^ "Stephen Kinzer - The Boston Globe". bostonglobe.com. Retrieved December 13, 2016. ^ "Stephen Kinzer - Watson Institute". brown.edu. Retrieved December 13, 2016. ^ Noam Chomsky; Edward S. Herman (2002). Manufacturing Consent. Pantheon Books. ISBN 978-0375714498. ^ Noam Chomsky (2002). John Schoeffel, R. Mitchell, ed. Understanding Power: The Indispensable Chomsky. The New Press. p. 25. ^ "Author Kinzer Charts 'Century of Regime Change'". NPR. April 5, 2006. ^ "The United Nations in the Heart of Europe - News & Media - Action Group for Syria - Final Communiqué - 30 June 2012". web.archive.org. July 10, 2012. ^ Kinzer, Stephen. "The US doesn't even care about Syria — but we keep the war going - The Boston Globe". BostonGlobe.com. Reset: Iran, Turkey, and America's Future, Times Books, 2010, ISBN 978-0-8050-9127-4. Poisoner in Chief: Sidney Gottlieb and the CIA Search for Mind Control, Henry Holt and Co., 2019, ISBN 978-1-250-14043-2. Booknotes interview with Kinzer on Crescent & Star: Turkey Between Two Worlds, October 21, 2001. ^ "The True Flag - Stephen Kinzer - Macmillan". US Macmillan.